Backup Operation Failed. [ERRORS & WARNINGS] 1/1/2015 11:11:11 PM W3831 Unable to find any media that can be used in this job. 1/1/2015 11:11:11 PM E3834 Unable to find any suitable media that can be used in this job. Information SERVER01 1/1/2015 11:11:11 PM 2026 Note: Media Tape1, ID 2877 expired on 30/11/14. The backup operation failed because by default, the tape’s expiration date is set for + 3 years the first time the tape is used by ARCserve. After this time elapsed, the backup job will not be able to overwrite these tapes. In the right click, double click on a REG_DWORD value named ResetTapeExpirationDate, and change its value date from default 0 to 1. The value date of 1 makes ARCserve format the expired tapes automatically to extend the expiration date of the tapes for another 3 years (the default setting) or the number of years specified in “TapeExpirationInYear” registry value. 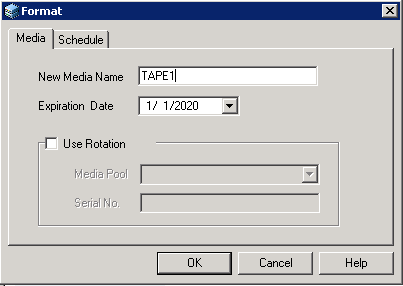 If you want a longer expiration date is set on newly formatted tape by default, you can change the TapeExpirationInYear to longer duration, e.g. 5 for 5 years. Alternatively, you can manually change the expiration date of expired tape by formatting it. To do so, go to ARCserve device manager, right-click on the tape and choose Format. Type in the New Media Name and enter the new Expiration Date (current expiration date is shown by default). Then, click OK to start the format process. Once done, the tape will have extended expiration date.